VA Police beat up man, charge him with felony assault. 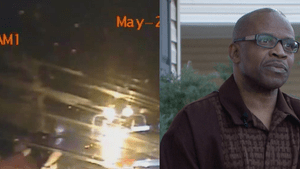 ORANGE COUNTY, Va. (WUSA9) – Although experts say dash cam video doesn’t prove Stuart Fitzgerald committed any crime – or explain why a deputy threw him onto a highway – he could face more than 15 years in prison. The audio is missing and images from other law enforcement cameras on the scene were never reviewed by investigators. After throwing Fizgerald to the ground and shackling him, authorities arrested him for felony assault on the two responding officers. The officers were not investigated for misconduct. The WUSA9 investigation found footage from several other cameras either wasn’t taken, wasn’t collected by investigators, or is missing. Dash cam video from May 26, 2014 shows an Orange County, Virginia deputy throwing Fitzgerald onto a four lane highway, but the camera is missing audio because of what the sheriff’s department calls a malfunction. The Orange County Sheriff’s Department tape also shows the edge of Fitzgerald’s head repeatedly hitting the hood of the cruiser, which the deputy said Fitzgerald did himself, intentionally. Fitzgerald said he doesn’t clearly remember that part, but hospital records show his face was bloodied and he suffered a chipped tooth. “If he was absolutely handcuffed what was the purpose of the tackle,” Hosko asked. Although there is no audio during the entire confrontation, about 25 minutes later, audio returns. Over modulated audio is continuously recorded on the same dash cam for several hours. Hosko said the video also does not provide proof Fitzgerald assaulted the officer. Orange County Sheriff Mark Amos would not discuss the charges against Fitzgerald because of pending charges, but defended throwing the man onto the highway. Six other cameras, assigned to other officers who responded – that should have been at the scene – did not record video or audio of the confrontation according to the agency. Click here to see the hand written criminal complaint that could send Fitzgerald to prison. Fitzgerald was pulled over for “flashing his high beams at me” according to a criminal complaint charging him with three felonies. Fitzgerald didn’t have a license and when the deputy asked him to sign, he refused. The video shows the door opening less than two seconds after the officer’s first attempt, and shows Fitzgerald getting out with the officer having one hand on him. Orange County officials had originally claimed that the video WUSA9 reviewed contained the only images from the scene. Since WUSA9 identified six other cameras, the agency has acknowledged finding additional images and the separate Town of Orange Police Dept. has acknowledged that of the four cameras it had at the scene at least one dash cam recorded video. The agencies have not released the additional images identified in response to our repeated inquiries – nearly a year after the incident. 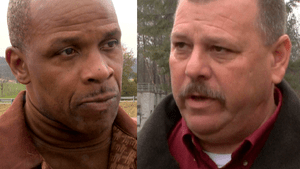 Gordonsville, Va. Police also responded, but the officer required by policy to wear a body camera was not wearing it according to the Police Chief. The agency said officers were not routinely wearing them at the time because they were malfunctioning. They have since been replaced with new cameras. Fitzgerald said, he wasn’t fighting the officers, but was screaming in pain as the officer twisted his wrist and tightened the handcuffs. Fitzgerald had been wearing a tuxedo, returning to his Waldorf home from Charlottesville where he had been on business before he found himself handcuffed and shackled in Orange County. Records show an arrest history going back to 1993 including simple assault, burglary, and drug possession, but our review didn’t identify any convictions. A former Marine, he acknowledges drugs were a former demon in his life, but he said he’s clean now and hospital and police records of the Orange County incident show no indication he was under the influence. “I turned my life over to Christ and been clean since,” Fitzgerald said. He explained the missing audio as malfunctioning equipment. Richmond attorney Steven Benjamin with the National Association of Criminal Defense lawyers said not only does the video not show Fitzgerald assaulting police it raises questions as to whether police assaulted Fitzgerald. Charged with three felonies, including assaulting police, the man thrown to the highway is living in fear. “I mean, getting convicted of something I didn’t even do,” Fitzgerald said. Since our inquiry authorities acknowledge finding additional recordings and the Orange County deputy has left the department. The agency won’t tell us why he left the agency and we couldn’t reach the officer for comment. If convicted, Fitzgerald could face more than 15 years in prison based on his word versus two officers who claim they were the ones assaulted. Fitzgerald will have his first appearance in court on April 10th. After he was arrested, Fitzgerald spent five weeks in jail before his court appointed attorney asked for a bond hearing. His current attorney, who was unaware of some of many of our findings, has been temporarily suspended by the state bar eight times, including while representing Fitzgerald, for not meeting administrative licensing requirements, according to a Bar official.